CENTRAL REGION - GT TOURS INC.
Capital of Chile located in the Central Valley, framed by the majestic Andes Mountain range. Important metropolis where the French classic architecture is combined with the barroque and colonial Spanish architecture with modern tall buildings. The beautiful and extensive valleys that surround the city give origin to famous Chilean wines, in addition to an pleasant Mediterranean climate, among summits of the mountain range with their ski centers and the privileged coast of the Pacific Ocean. One of the most important resort area for summer vacations in South America, located only 120 km from Santiago in a incredibly naturally beautiful rocky coast. The central zone can be travelled through by a route next to the sea that follows the curves of the steep coast where it is possible to enjoy a very good gastronomic offer of sea products in the typical restaurants installed in front of the Pacific Ocean. The dusk offers romantic strolls by the Peru Avenue, on imposing rocks whipped by the waves and, at night the casino offers a big number of game rooms and live shows. Reñaca, Concón, Santo Domingo, Algarrobo and Isla negra, being the latter the place where the poet and the Literature Nobel Prize winner Pablo Neruda built one of his three houses, are some of the places that can be visited. The most important port in Chile, recently declared a World Heritage by UNESCO, constructed on hills in the coast of a busy bay surrounded by the majesty of eternal snows in the distant mountain range. The true attraction of Valparaiso are the hills that divide the city in two levels. In the lower part are the banking and commercial areas on Prat Street, Emerald Street and Pedro Montt Avenue with their cafes and theatres and, in the upper part, the characteristic and colourful buildings hanging from the hills and cliffs in an impressive layout of streets, side streets and alleys that wind. The use of elevators to join the two levels of the city is a tradition. The history of Chile mixes with the grapevine and the wine. From the Spanish conquest the sacrament of the catholic Eucharist is introduced in Chile and for this reason wine was required as the fundamental part. The missionaries considered indispensable to plant vineyards and to prepare Indian wines. From the end of the XIX century an important impulse takes place during which visionary businessmen gave a form of cultural expression to grapevine. Names like Macul, Errázuriz, Pedregal, Ossa, Urmeneta, among others, covered great extensions of land with grapevines being this the starting point to the Chilean fine wine. Famous are the Sauvignon Blanc, Chardonnay, Riesling, Gewürztraminer, Semillon, Cabernet Sauvignon, Merlot and Pinot Noir stocks. After 100 years we can say that the Chilean wine has obtained the seat of honour that it deserved, not only by the passing of time, but mostly by the real image that it has in the sustainable vine growing world thanks to the technical work, the ideal climatic conditions and exceptionally rich soils. Remote island located at 3.760 km west from the Chilean coasts. Mystic and overwhelmed with legends, its history goes back to the IV century d. C. Famous are the colossal stone statues, of up to seven meters high, known as moai, that are standing with their backs to the Pacific and which origin is still a mystery. There is still no consensus on the origin of its first inhabitants. Some state that the first settlers came from the Polynesia but others assure that their origin is South America. 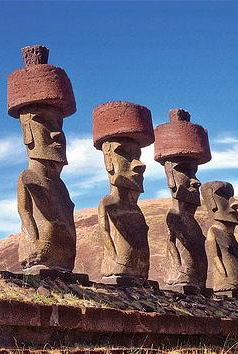 Whatever the theory may be, the only thing for sure is the fact that the men who built the moais were part of a hierarchic and very religious culture that wanted to raise his ancestors to the quality of Gods. This matchless archaeological patrimony can be fully admired in Tahai, a ceremonial center that combines testimonies of the Rapa nui culture at its moment of apogee. Given its particular geography, Chile is perhaps one of the few places in the world where a sunset can be appreciated a dusk in the Pacific Ocean and in a few hours, depending where one is, to be skiing in the majestic Mountain Range of the Andes. Due to this we can find many Ski and Mountain Centers, some of them considered among the best of the world and chosen by important teams of professional skiers for their training and even to participate in the championships that take place here. From the Central Zone, Santiago, Valparaiso and the surroundings, until Punta Arenas, in the South end, many ski centers have been built, each one with singularities, types of tracks, heights, infrastructure and spectacular natural surroundings that are the delight for any fan of the white sport or for those who discover this sport for the first time.